China leads the world in exports in 2017. 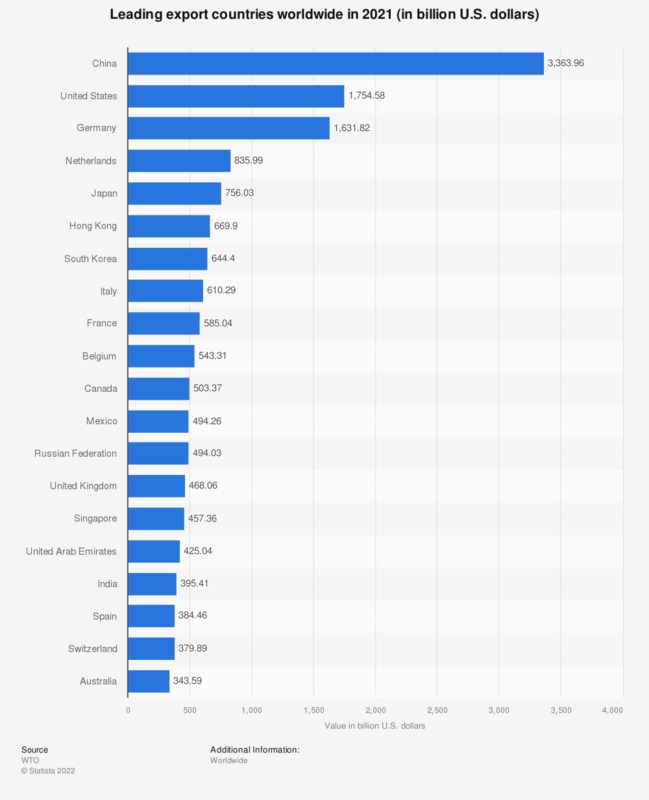 China was followed by the United States, with exports valued at 1.58 trillion US dollars, and Germany, with exports valued at 1.05 trillion US dollars. The value of goods exported from China grew immensely between 2002 and 2014. In 2002, China’s exports were valued at about 327 billion US dollars. China’s export value grew to 2 trillion US dollars in 2012, the first year in which China exported more than 2 trillion US dollars worth of goods. Year over year export growth remained above 17 percent between 2002 and 2012, except in 2009 and 2012. In 2004, export value grew by over 35 percent. In 2011, China accounted for about 10 percent of global merchandise exports and about 4 percent of global service exports. China’s greatest export product category in 2011 was machinery and transport equipment, of which they exported 902 billion US dollars worth. In 2012, China exported 159 billion US dollars worth of clothes and clothing accessories. United States exports, meanwhile, were valued at 1.6 trillion US dollars. Transport equipment exports in 2012 were valued at 248 billion US dollars. Computer and electronic products accounted for 204 billion US dollars in exports. In 2012, the greatest growth in export value occurred in livestock and livestock products, where exports grew by 21 percent. Texas and California were the top two US states ranked by value of exports in 2012. Texas ranked first with exports valued at 265 billion US dollars.